A lunar elevator would create a permanent way to transport goods from the moon to low orbit Earth. NEW YORK – A new exhibit at the American Museum of Natural History will highlight some of the cutting-edge space technology in hand or under way, from a rover that looks for life on Mars to an elevator that rises into space from the moon. "Some of these technologies are already being studied and planned, and they are grounded in real scientific possibility," museum president Ellen Futter told media members at a preview of the exhibit earlier this week. 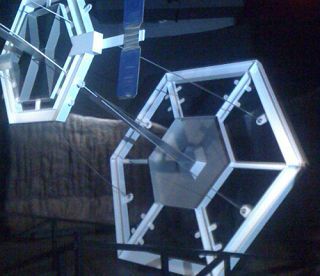 One of the most innovative technologies on display is represented by the model of a lunar elevator. It features a skinny cable that in real life would rise thousands of miles into space from the surface of the moon, supporting cable cars that could deliver cargo to and from a docked spacecraft. The main cable would rise from the Moon’s equator more than 28,000 miles and would stay upright in space, ending in a docking station. It’s not yet known which material would be used for the cable. The cable cars would be fueled by solar electricity or lasers and would rise slowly to the docking station. Such an elevator would cut the expense of trips to the moon and would create a permanent way to transport goods from the moon to low Earth orbit. The exhibit also provides for the possibility that humans will return to the moon and stay for good. A base camp would be necessary to help them eat, sleep, bathe and work. A small replica of what the private space company Bigelow Aerospace proposes to send to the moon features an expandable spacecraft module. Astronauts would leave Earth in a spaceship, dock in space with the module and bring it down to the moon. Meanwhile, astronomers propose to one day build a reflecting telescope, called a liquid mirror telescope, at the moon's south pole. The exhibit features a model of one that forms a mirror out of liquid spinning smoothly at a constant speed. It reflects and focuses light toward a target, forming an image of a starscape. Mars is a cold and dry planet now, but scientist think millions of tons of liquid water once flowed on its surface. This means that life could have once thrived on the Red Planet, making it a high-priority target for future space exploration. Toward that end, the new exhibit includes a replica of NASA's Curiosity rover, a car-size vehicle scheduled to launch next week and reach Mars next August. Its purpose is to look for life on the planet and explore the Gale Crater, an area once filled with water. Curiosity also will pick up samples from the surface for testing. Astronauts could learn more about Mars through other innovative tools, such as a hand-held device that searches for underground objects by sending signals into rocks. It can detect metal or nonmetallic materials and report how far underground they are. Astronauts also will be using an X-ray fluorescence spectrometer that beams X-rays into rocks to identify up to 30 different elements at once. "We wanted to use different interactive technologies to bring learning and innovation to a deeper level for attendees," Helene Alonso, director of Exhibit Interactives and Media, told TechNewsDaily. "Incorporating interactive elements is becoming an increasingly important part of new exhibitions, and everything we do is built in-house." The exhibit also features a console that gives visitors the feeling of flying around Mars and zooming in on its surface features, as well as a Mars terraforming game that runs on a multi-touch table. The exhibit runs until summer 2012.